Greek, Etruscan, & Roman Bronzes (MFA), no. 043; Sculpture in Stone and Bronze (MFA), p. 119 (additional published references). 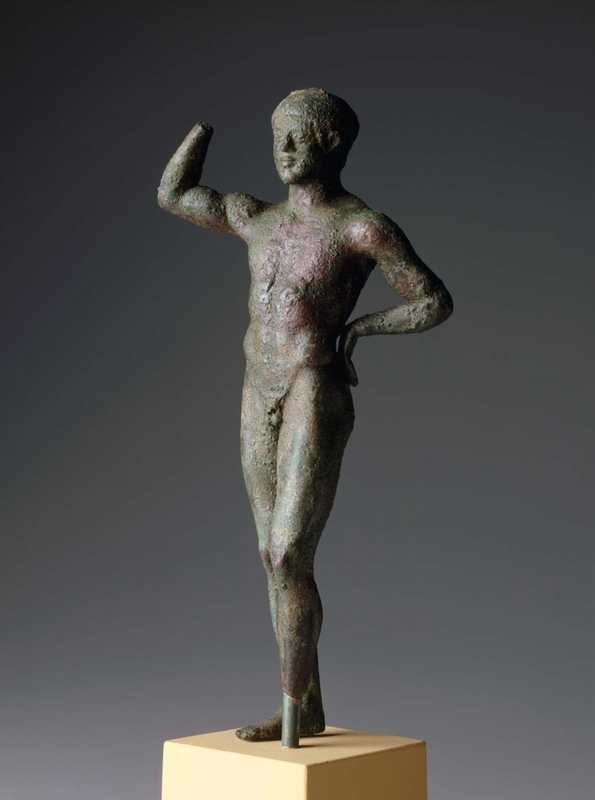 Bronze support for a mirror in the form of a youth crowning himself or holding a discus in his raised right hand (diskophoros) This athlete is one of the most satisfying manifestations of the high transitional style that has survived among bronze statuettes. His hair has the arrangement in close curls creating an overall cap-like effect that is characteristic of the “Blond Boy” from the Acropolis. Solid construction of the chest, a bulge at the top of the ribcage, and prominent buttocks when seen in profile all hold together through strong, rounded muscles and a fine finish to the surfaces. The thrusting chin and heavy jaws are evidences of the severe style that led to the early work of Myron and the pedimental figures at Olympia. Condition: The right hand, left foot and ankle are missing. Traces of the mirror-holder are visible on top of the head. Rough green patina. 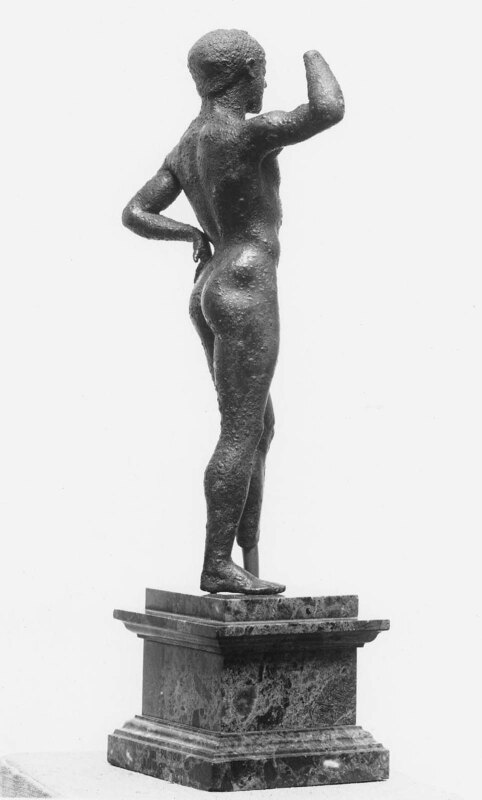 October 1, 1896: sold by Edward Perry Warren (b. 1860 - d. 1928), London, to the MFA (according to Warren's records, this was said to come from Croton. ).